The SBIG ST-i uses a monochrome CCD sensor KAI-340, one of the few camera on the market to have a 16-bit A/D converter. A great mechanical and electronic technology at a very competitive price. Ideal for planetary imaging even for high resolution, but often used as an autoguider, with a very good sensitivity and low electronic noise. If you are looking for a sensor with high performance but very compact size, the SBIG ST-i is the ideal choice. It's very compact and it can be mounted on an off-axis system or on a guide scope, it is the only one in its category to be fitted with a double shutter, electronic and mechanical. Rather than using a low cost CMOS sensor (with high noise), the ST-i uses a high quality, low noise, Kodak CCD. The KAI-340 CCD has a measured read noise of only 9e- in the ST-i camera. This is the same CCD used as the guiding sensor in the STX series cameras and in the AllSky-340 cameras. The array is 640 x 480 pixels at 7.4 microns square. Anti-blooming is standard. On-chip binning is available for 14.8 micron pixels if desired. Various sub-frame modes may be used to speed-up the focus and download rates. A full frame high resolution image will update at the rate of approximately 5 frames per second. In addition to full-frame, half-frame and quarter-frame modes, the user may select a sub-frame region of interest (ROI) of any size located anywhere on the CCD. In focus mode, using a 20 x 20 pixel box the update rate is greater than 20 frames per second. This sensor is available in monochrome or color. Kodak describes the performance of this CCD: "Designed for demanding imaging applications, this sensor has additional features including electronic shuttering, peak QE (quantum efficiency) of 55%, extremely low noise and low dark current. These features give this sensor exceptional sensitivity and make it ideal for machine vision, scientific, surveillance, and other computer input applications." 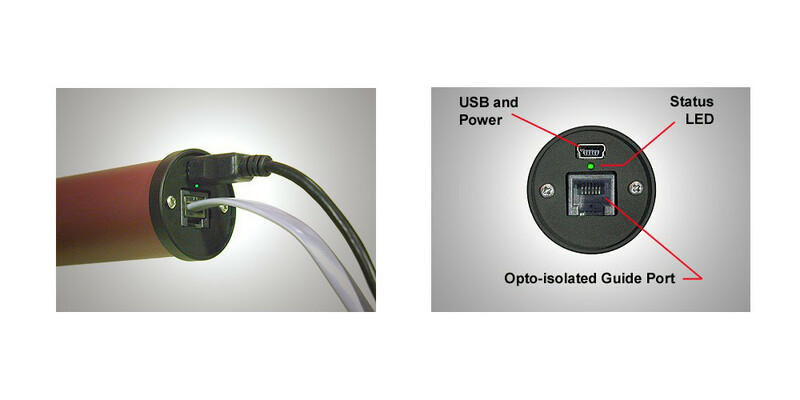 This sensor’s electronic shutter allows exposure times as short as 0.001 seconds. Most other eyepiece sized cameras rely on this type of "global" shutter alone due to the difficulty and cost of building an additional mechanical shutter into the camera body. However, in the ST-i camera we have also included a mechanical shutter enabling the camera to automatically take dark frames. This feature alone dramatically improves the performance of the ST-i, particularly when used as an autoguider. Cooling of the CCD to reduce dark current is unnecessary at the short exposure times common to planetary imaging and autoguiding, but there remains the possibility of bright pixels in an image that can raise the threshold of brightness required for the most sensitive guiding performance. 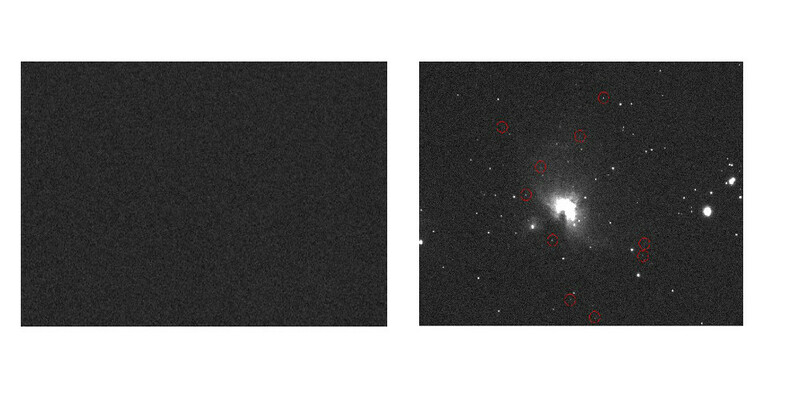 The ability to automatically take and subtract a dark frame results in a very smooth background against which detection of dim stars is more reliable. Finally, while some inexpensive guiders save cost by using low cost 8 bit or 10 bit electronics, the ST-i camera uses a high quality 16-bit A/D for superior resolution of the full dynamic range of the CCD, greater than 70 dB. The Planet Master Commands in CCDOPS is used to take the sharpest images of planets or other objects. It takes a sequence of images, grading them for sharpness and keeps the sharpest one. Typically you would take short exposures, knowing that throughout the sequence a stable period of seeing will give a clear image. The Planet Master command beeps twice each time a sharper image is acquired. When you're all done hit the Done key and the Sharpest image will be shown. The dialog also shows you the current sharpness and the best sharpness in terms of a Figure of Merit (FOM). If the object is too bright even with the shortest exposures you may find placing an aperture mask over the telescope or using neutral density filters will get the brightness in range. The Grade Image By Sharpness command allows grading a set of already acquired images. It's like an Off-Line version of the Planet Master command. Many planetary imagers like to average several of their best exposures. This requires taking a large number of images in a short time and then examining each image for the best of the lot of the best few of the lot. In this case the imager might prefer to use the Autograb function of CCDOPS to capture as many images in as short a period of time as possible. (Planets rotate!) PlanetMaster software may then be used to automatically examine a series of images and assign a Figure of Merit for sharpness to each one. Then only the best of the lot can be selected for averaging. A sample 1 second dark minus dark frame is shown above on the left, along with a 1 second light minus dark frame of the Orion Nebula region on the right. The 1 second light frame, taken with a 60mm guide scope, shows numerous potential guide stars fainter than 11th magnitude, and many more 10th magnitude or brighter. The ST-i comes in a padded hard case with 15' USB cable, telescope tracking cable and software CDs that include installation instructions, CCDOPS with PlanetMaster.